This lesson plan by an experienced high school physics teacher was created specifically to accompany the PhET simulation "Alpha Decay". It is intended for students who have had prior exposure to half-life and a fundamental understanding of nuclear decay. It provides guided directions to help students make predictions and verify their ideas through data tables and charts. As it progresses, students investigate a specific radioactive decay scenario, using the simulation to compare results of multiple trials. The lesson, as a whole, is designed to encourage deeper thinking about what half-life means in terms of single particles and larger samples. The alpha decay simulation, which must be open and displayed to complete this activity, is available from PhET at: Alpha Decay. This lesson, which meets multiple national standards for science and math, targets AP and algebra-based physics. 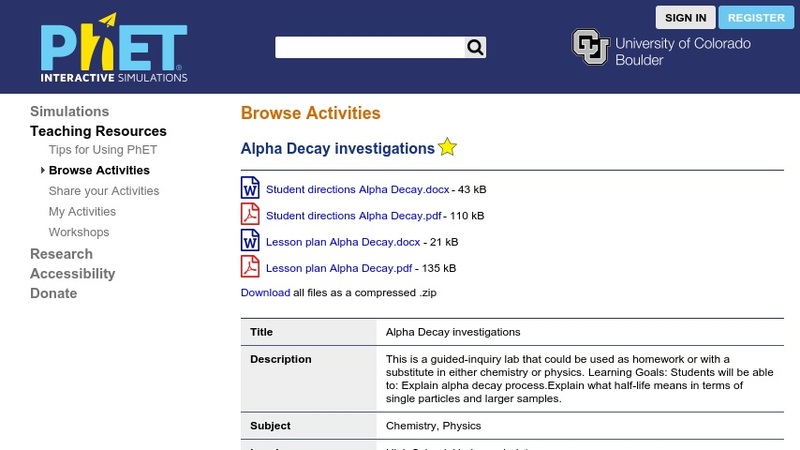 See Related Materials for a simpler activity on alpha decay appropriate for Grades 8-10. This lesson is part of PhET (Physics Education Technology Project), a large collection of free interactive simulations for science education.